Jami’s love for hair began when she was just a young girl. After completing her education at the Image Group Hairstyling Academy in London, Jami knew that becoming a talented colourist and stylist was her passion in life. 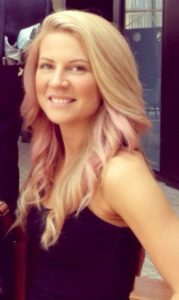 With over 13 years in the industry, Jami thoroughly enjoys being part of an amazing L’Oreal Professional salon and she strives to continually educate herself on the ever-changing collections and trends. Jami’s biggest achievement in her career was in 2013 when she was announced the winner of L’Oreal men’s colour trophy. At this moment, Jami knew men’s cutting was one of her strong points. Jami also excels in women’s highlights and bridal up styling. Jami puts her clients’ needs at the top of her priority list and ensures they are satisfied on every visit. Jami is excited to start this new chapter in her life with the Taz team and will continue to appreciate her career as an artist.